Each year our high school dedicates one varsity football game during the season to those battling cancer. It's called the Go Pink game and encourages everyone to wear pink to show their support, and also sells gear (shirts, hoodies, bracelets, etc) with proceeds going to one recipient. This year the Hand Family was our recipient as their 10-year old daughter Hailey is fighting Acute Lymphoblastic Leukemia. I work in the concession stand at every home varsity game. I've had four kids go through this high school and have spent many nights volunteering my time to help the team. My 15-year old, Dominic, is a sophomore JV player and my last one to go through this school. I also have a senior graduating this year. I love the opportunity it gives me to get to know other parents and kids! 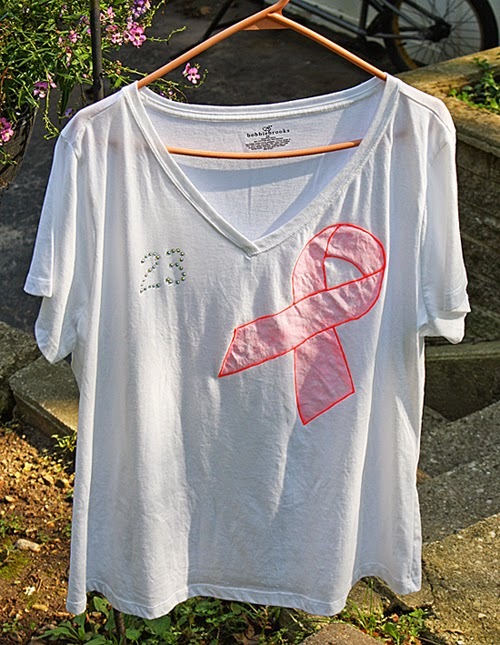 So this year I designed my own shirt, donning my son's number 23, in all its glitteriness. 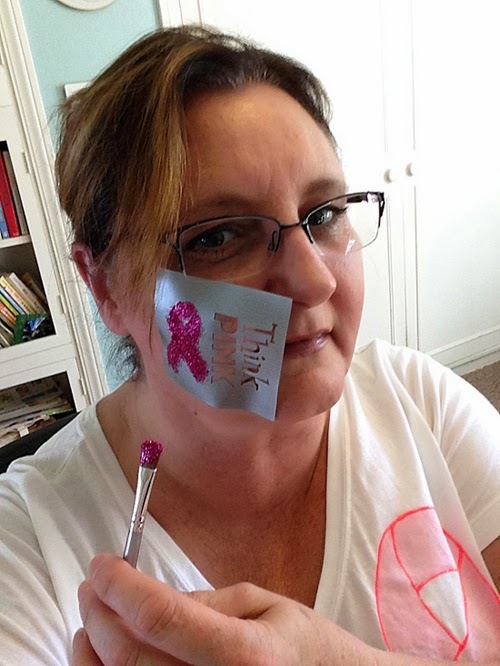 I Love to Create was awesome enough to send me several of the Tulip Body Art Glitter Ribbon Tattoos to use at the game. 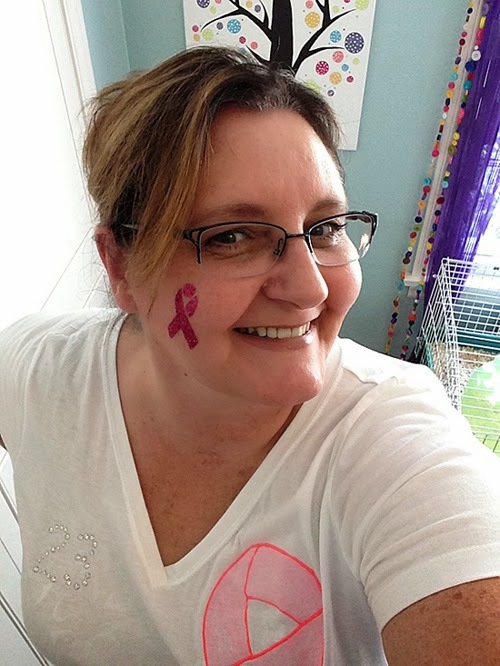 Many of the moms working the game were thrilled to have their faces tattooed for a good cause! I created my own stencil using this ribbon I found on the Internet. I'll show you how I did it below. First you will need to create your stencil. it's easy to do, so don't worry! Insert cardboard inside shirt. Print the pattern and positioning it on your shirt. Cut out the pattern. Turn a sheet of contact paper clear side down, so that the backing is facing up. Turn the pattern upside down and place it on top of the contact paper. Trace pattern onto contact paper backing with a pencil. Cut out the stencil starting from inside the ribbon. You want the outline to stay in tact. Cut out the center portion as well, in between the ribbon intersections. Peel a small section of the backing off the contact paper stencil and stick it to the shirt. Continue peeling and sticking until all the backing has been removed and stencil is in place. Make sure all edges are stuck to the shirt to ensure there is no paint seepage. Squeeze out some of the Light Pink onto your paint palette. 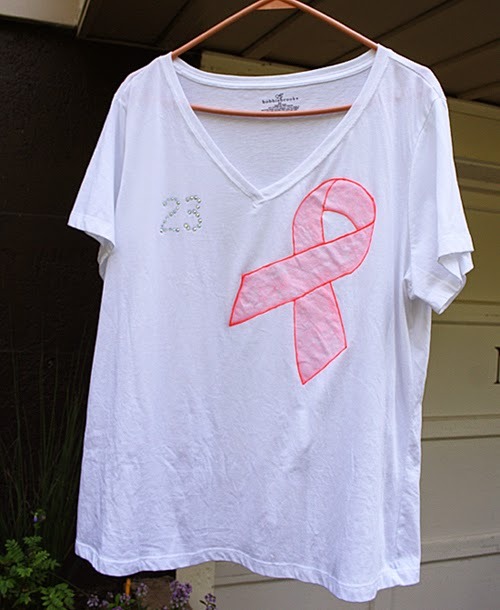 Use a cosmetic sponge to pick up some paint, dab off some of the excess and apply to the shirt. Using a cosmetic sponge, apply Fluorescent Pink around the edges of the ribbon. 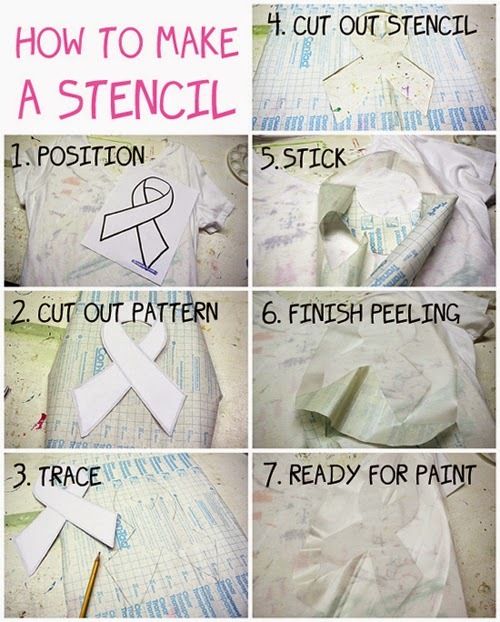 Peel the stencil off the shirt. Using Fluorescent Pink, begin outlining the ribbon. Finish the outline, making sure all edges are connected. Allow to dry for at least 4 hours. 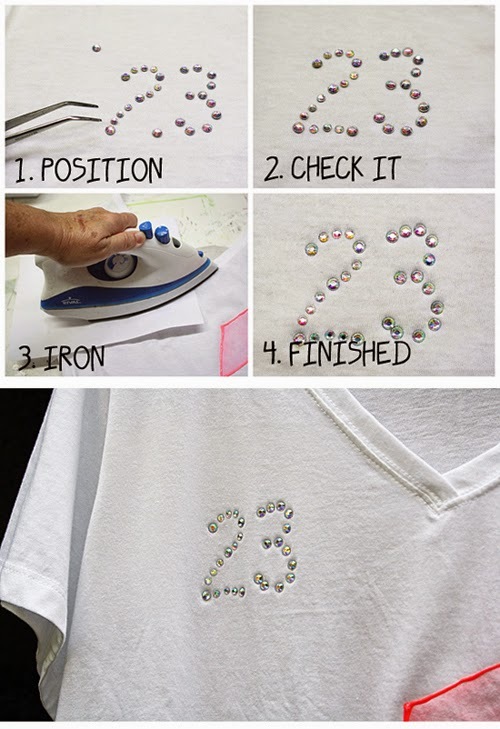 Use tweezers to position the crystals onto the shirt. Make sure everything looks good and is where you want it. Place a sheet of white paper gently over the crystals and press hot iron down directly onto the paper. Do not move the iron back and forth. Hold for 20 seconds. Remove the iron and admire your glam! And finally, to finish the ensemble :) I tattooed my face using the Tulip Body Art Glitter Ribbon Tattoos. They are really easy to use. Apply the sticker stencil to your skin, use the glue applicator to add the adhesive, then just dab on the glitter! It was easily removed with a cotton ball and rubbing alcohol. Overall the game was a great success and we were able to raise some nice funds for the Hand Family. 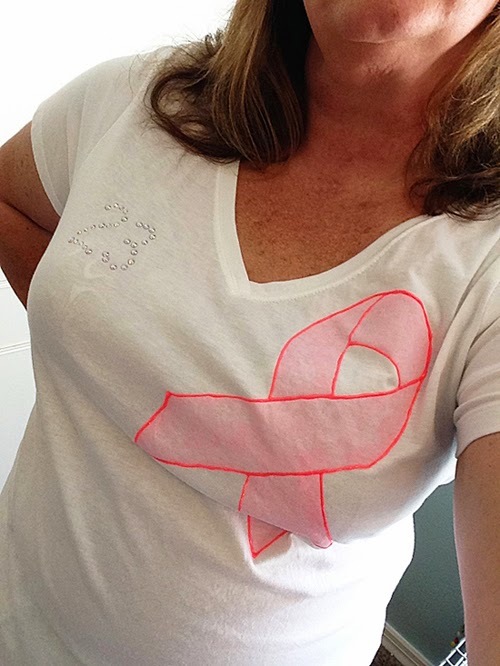 Remember that October is Breast Cancer Awareness Month. 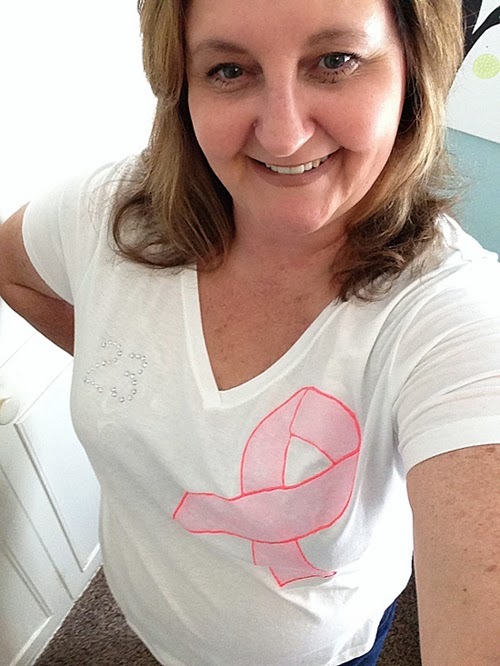 So be sure that you or your loved ones get their mammograms (where appropriate) and wear pink as often as you can!